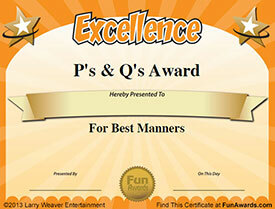 Looking for funny classroom awards? We have fun awards for teachers and fun awards for students of all ages. No matter what type of funny award you need, you'll find it at FunAwards.com! These funny teacher certificates range from teacher superlatives to classroom awards. They reference common classroom objects, literary figures, noted scientists, fairy tales, popular culture icons, and much more. Be sure to bookmark our site and check back for more free funny classroom awards!